• Cheshire College – South & West are proud to announce their partnership with Airbus UK Broughton Football Club. • Airbus UK Broughton FC have joined forces with Cheshire College – South & West to announce a prestigious football scholarship programme for 16-19 year olds in the local community. • Applying learners, who have a passion for football, will be selected for the scholarship programme, which will commence in September 2019. 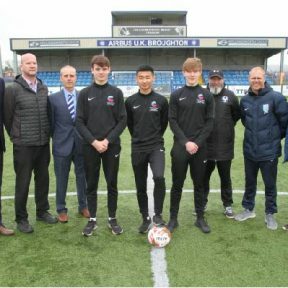 Cheshire College – South & West and newly promoted Welsh Premier League Football Club, Airbus UK Broughton FC have joined forces to announce a prestigious football scholarship programme for 16-19 year olds in the local community. Young athletes studying at Cheshire College – South & West will be selected for the scholarship programme, which will commence in September 2019. Unlike most football or sports scholarships, in which all players must study a Diploma in Sport, selected players will be able to choose any academic or vocational course at the College. The programme will be delivered by Jason Doggett, Sports Lecturer and Academy Co-ordinator, at the College, alongside Lee Starkey, Airbus UK Broughton FC Academy Director. Players will train five times per week, including conditioning and sports massage, as well as representing Airbus UK Broughton FC in their respective league competitions. Airbus UK Broughton Football Club’s Academy Director Lee Starkey added: “Both the academic programme and the professional sporting opportunities offered by the College will create fantastic prospects for our academy players. ‘’Our partnership will continue to grow as our talented coaches deliver the programme to the College’s learners. The College values enthusiasm, loyalty and ambition and recognises the importance of balancing study with wider development opportunities. The scholarship programme will encourage learners to express themselves creatively and extend their skills by promoting a positive culture of competition, teamwork and dedication. Coaches will receive weekly updates on attendance, targets and college work from teachers and players will not be able to train or play in matches if the agreed targets are not being met. Gareth Edwards, Assistant Director Public Services, Sport, ESOL, Travel and Tourism, at Cheshire College – South & West, said: ‘’This is a fantastic opportunity for anyone interested in gaining a football scholarship. For more information about the scholarship programme, please contact Jason Doggett on 01244 656555 or email jasondoggett@ccsw.ac.uk. If you are interested in studying at Cheshire College – South & West, or for more information, call 01270 654654 (Crewe Campus) 01244 656555 (Ellesmere Port & Chester Campuses) or visit ccsw.ac.uk.